EMERGING Geelong forward George Burbury will have surgery on his broken jaw on Thursday after a sickening collision with Pie Nick Maxwell in the Cats' two-point NAB Challenge win over Collingwood at Simonds Stadium on Wednesday night. Burbury, who was tipped to take over Paul Chapman's role up forward this season, was taken to hospital after slamming head-first into Maxwell's knee as he attempted to take a courageous mark deep inside forward 50. 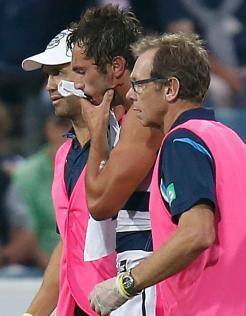 Cats coach Chris Scott confirmed the diagnosis, although, positively all of his teeth remained intact. "We thought it was really serious. The feedback from the hospital, while it's still serious and he needs surgery on his jaw it's not as bad as first thought. Fingers crossed, with the way doctors can wire jaws these days, he can get it stabilised pretty quickly. "So hopefully there's not too much time on the sidelines. We had eight trainers out there looking for his teeth, they were still in his mouth." The Magpies were not spared on the injury front either, with coach Nathan Buckley confirming Tim Broomhead (broken hand) and Nathan Freeman (hamstring) are both set for between three and four weeks on the sidelines. The injuries dulled a spirited Geelong win, with a late flurry of goals securing the 0.16.8 (104) to 1.13.15 (102) result. Broomhead had his right hand heavily taped when walking to the rooms at half-time, while Freeman – the Pies' No. 10 pick in last year's NAB AFL Draft – had his right leg heavily strapped. The trio were unfortunate victims of what turned out to be a high-intensity contest between two quality teams. Without skipper Joel Selwood (foot) steering the ship, the performance of the Cats' young, and revamped, midfield was one of the highlights of the night. Josh Caddy (19 disposals) and Cameron Guthrie (19 touches, eight tackles) thrived in different roles for the Cats. As usual, experienced campaigners Mathew Stokes (39 and 117 fantasy points) and Corey Enright (36 and 128 fantasy points) led the way in the possession column for Geelong. Collingwood finished with much of the running in the second half, but a late goal to starting Geelong substitute Jordan Schroder closed out the match for the Cats. White booted five goals in a lively display for the Pies, while star midfielder Dayne Beams helped himself to 35 touches and 109 fantasy points to be one of the best on the ground. Fellow Pies recruit Taylor Adams (31 possessions) was energised in his first game in black and white, while Ben Kennedy, in his new No.7, snagged two goals. Geelong: The Cats are nowhere near done. Geelong looked polished. And better still, hungry. Geelong's ball movement, particularly early, was clinical, while its ability to find targets in space was another key point to take out of the game. Granted they ran out of legs in the end, but the Cats showed they'll be right there at the business end of the season… again. Collingwood: There is plenty to like about the new-look Pies. With Scott Pendlebury starting in the subs' vest, a number of Magpies stepped up. Buckley was pleased with the way his team set up defensively and hung in when the Cats got the early run on. Geelong: The Cats had no new faces, as such, although elusive forward Lincoln McCarthy – who played one game in 2012 – did enough to suggest he belongs at the level. Those at the Cats rave about his ability in traffic, and it was on display at the Cattery. McCarthy, who has battled back from a navicular fracture in his foot, finished with eight touches, but he also laid six well-earned tackles. Collingwood: Marquee recruit Jesse White justified his selection with five goals, Taylor Adams had 24 disposals through the midfield and Tony Armstrong did enough to suggest he could be an important depth player for the Magpies. Disappointingly, highly-rated forward Tim Broomhead injured himself early in the game.